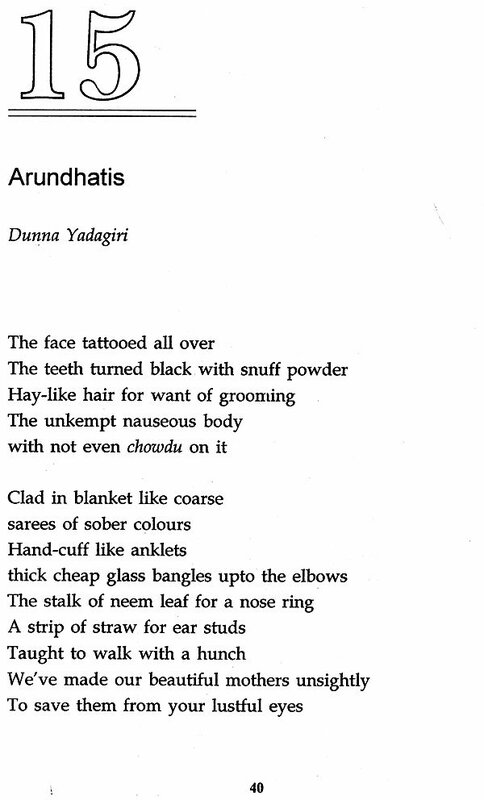 Telugu Dalit Poetry Today: Telugu Dalit poets produced poetry in the past, but it was only after 1980s they started producing powerful protest poetry. Dalit movement in Andhra Pradesh has not only given birth to many poets but also endowed the existing popular poets with Dalit consciousness. The poems in this anthology have to be read against the backdrop of social and economic injustice that Dalits suffered for many centuries. A majority of the poets besides proclaiming self-respect for Dalits, questioned and protested against the existing social structure in their poems. This anthology consists of the poetry of well-known and low, profile poets. No doubt every poem is an expression of powerful emotions and there are a handful of poems with philosophical ideas too. In the present socio-economic and political scenario, social justice is the most debated issue. The poems certainly give a vivid picture of Dalit life in India and remain a valuable source for students and scholars who are genuinely interested to have an in-depth study of this section of society through Dalit literature. Thummapudi Bharathi is a professor of English at Sri Padmavati Mahila Visvavidyalayam, South India. She has published extensively on American and Commonwealth literatures. She is the recipient of Olive I. Reddick (Junior) award for 2003 from IACIS and was Associate at Shimla, Himachal Pradesh. She is the author of The Novels of John Gardner (2002), A History of Telugu Dalit Literature (2008), The Critical Response: Selected Essays in American Literature (2011), Dalit: Issues and Challenges (2015) and The Critical Pursuit: Selected Essays in Literature (2016). Today on Thursday, December 10, 2009, Barrack Hussein Obama received the Nobel Peace Prize in Oslo, Norway. In normal circumstances, a black man receiving a prestigious honour from a group of Europeans would be a cause for celebration, but if your mind is liberated you see life and history from the point of view of those "dalited", pressed underfoot by the amoral powers of those with money and the means to coerce others. Just as sure as my Dalit brothers have long tired of the Jagjivan "Babuji" Ram and assorted "kept-Dalit" leaders who fail to truly transform India. The same is true for America's version of the Dalits-the Afro-Americans, Puerto Ricans, Aleuts, and Amerindians. America has a caste system and I am twice" stained" in the social hierarchy for being of African and Native American stock. I am the confluence of the oft mocked docile black slave and not-too-ready for modernity genocide- friendly Indian. If you like, I am the Western world's ready- made version of an Untouchable. Nonetheless, just as your Dalit brothers and sisters have fought since time immemorial to sunder the chains of ignorance, caste, oppression, and related forms of injustice, my people, too, have struggled to overcome the socio-cultural, economic, political and psychological slavery that caused us to hate ourselves and see God in the image of those that exploit us. The divine spirit of God has birthed, in people long wrongly shackled to the margins of human existence, champions like Dr. Martin Luther King, Jr. and Dr. Babasaheb Bhim Rao Ambedkar to show us that we are equal creations of the Almighty. You are blessed by the movement for social justice in your nation by Ambedkar to be able to read and have attended school to better yourselves, and the same is true for me. What you are about to read in this collection of poems is the heart and soul of Telugu Dalits releasing their verse into the universe to water the thirsty spirit of knowledge that is inside of all people. 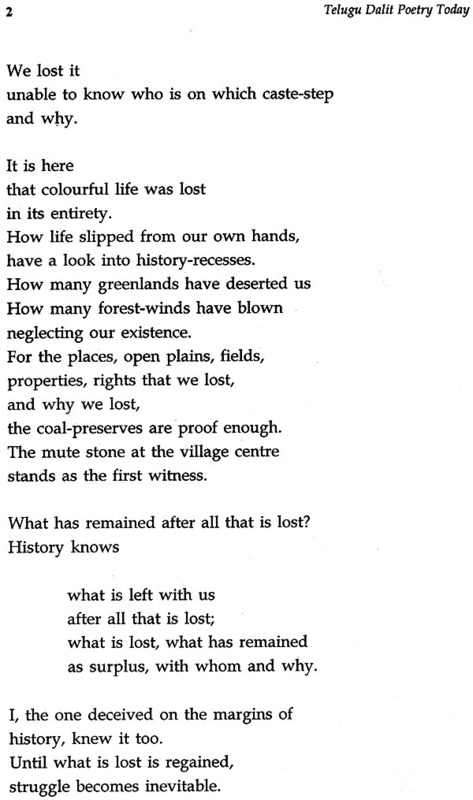 Without a history, without a literature, without expressive arts people cannot produce the inner wherewithal to improve their lot or pass on to those unborn the lessons necessary to overcome longstanding injustices or those to come. Therefore, the use of the written word is central to any group of people that would make their mark on the world and leave an inheritance for their posterity. I have read and been impressed by the creativity, beauty, panache, spirituality, and pathos of the writers. Minus the words that do not form a part of the English language forced on my conquered ancestors each of the poems has great relevance to me, and I have never set foot on the soil of the great Indian subcontinent. Some may ask why I have become interested in the condition of the Dalits of India and the wider Indian diaspora. First, my interest in this question is lifelong and started exactly forty years ago in 1969. My father was the pastor of a small storefront church in the slum community on Capitol Hill in Washington at 418 H Street. As Pentecostals we tended to have excessively long church services, and I often retreated from the sanctuary of the church to watch a small black and white television. Fortunately for me, there were no other children there to change the channel. Back then, Jerry Lewis, John Wayne, and Elvis Presley films tended to be the favourites of my peers. Nonetheless, I was alone and a film with images more stark than those where I was showed India from the perspective of director George Cukor's interpretation of John Master's novel Bhowani Junction, written in 1952. The film was set amidst the turbulence of the British withdrawal from India in 1947. One of the more salient themes of the film was the identity and social status struggles of Anglo-Indian people. The main character Victoria jones, played by Ava Gardner, in self-defence kills a British officer. Victoria had fled India joining the British army, only to return home and find many of the issues of racism and social oppression remained unchanged. Furthermore, there is a scene in the film where a large number of Dalits had been massacred, and as the people on the train stopped to look at the destruction, a baby begins to cry. In the dialogue there is some discussion that the dead untouchables were fated to suffer anyway. Worse still, there was a comment made by one of the characters that the baby be left to die with the mother. However, Victoria takes the baby as her own- much to the disdain of the Indians on the train." The movie rivetted me, because I understood that there was racism against me at that tender age but it shocked me to realise that human prejudice and hatred existed towards my social counterparts in India - the so-called ritually impure Untouchables! From that age onwards, I made a commitment to myself to know and forge ties to people who were oppressed in India. At the age of 10, I read Gunter's Inside Asia, and focused all my attention on India. I learned about casteism, varna, and the entire Brahminical structure of oppression that mirrored the Anglo-Saxon white supremacy that birthed modem racism in the western world - mostly notably in the form of American Jim Crow Segregation, the White Australia policy, and South African Apartheid. Sadly, America does not attract the progressive or radical Indians, instead we get the selfish, Hindutva supporting, white-minded, and Anglo-Saxon worshipping Indians who imagine themselves to be very dark white people. In spite of this, I have kept the faith of many Afro-American intellectuals who have hoped for Indians to become our brothers to rid the world of white supremacy and casteism. In the early 1980s, I was able to study under the aegis of the noted Indian historian Dr. Waiter Hauser. It remains to this day one of my favorite courses. Only in the 1990s did I begin to find Indians who shared my understanding of the need for a two-front assault on casteism and racism. In October 1997, I was able to host the first birthday celebration for Dr. Ambedkar at Howard University's Ralph Bunche International Affairs Center. I was blessed to witness the Dalit people demanding their rights at the United Nations World Conference Against Racism in Durban in 2001. It was a great time, and recently the United Nations at long last has begun to treat the issue of caste as a serious social system of oppression. In 2003, I was blessed to attend the first International Dalit Conference in Vancouver, British Columbia. There I met the one true Dalit woman whose intensity is a beacon to help her people- Dr. Thummapudi Bharathi. In as much as I know that the Telugu language is the third largest official language in India, and I am certain that everything composed in Telugu and English has the power and potential to reach millions. Now more than ever, as the climate of intolerance and aggressive casteism increases, we who are writers and thinkers must sow the seeds of sanity, enlightenment, and compassion. 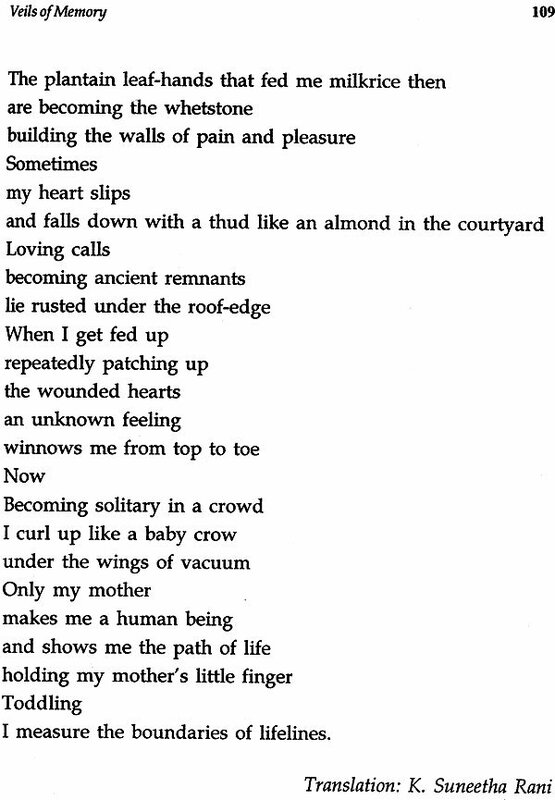 This book of poems does exactly this. In particular, the voice of the Indian woman comes through powerfully and slices through the veils of superstition, sexism, and feudal patriarchy better suited for a toxic land fill than a culturally accepted manner for men to treat women. As I write you, private armies of thugs controlled by "upper castes" run a secret government which is nearly a carbon copy of similar practices in the benighted state of Bihar. These caste-based terrorists (e.g. Nallamalla Cobra, Nallatrachu) threaten the modicum of progress made in Andhra Pradesh. Gutless police and career bureaucrats have little incentive to protect the huddled masses of the poor. Caste-based private armies flourish and we can be assured that the majority of their attacks will be and have been directed against Dalits and the landless poor. Rich, upper-caste elites see the poor as easy prey. Thus, they organize violent atrocities and dehumanizing programmes to keep the poor fearful and compliant to their feudal order. Who can forget the Tsundur massacre of 1991? It is in this context of oppression and resistance that the writers try to humanize themselves and their communities. Thanks to my America's so-called "War on Terror", many nations can now directly or indirectly wage war against the people. In Andhra Pradesh caste-based armies use their anti- Maoist reputations to wage a war of intimidation against the people. Among these: Green Tigers, Nalladandu, Red Tigers, Tirumala Tigers, and Narsa Cobras. The Nallamala Nallatrachu has threatened to kill residents in a Dalit colony in Prakasam district. One gang, the Nallatrachus, is known for murdering Dalits. It has already claimed responsibility for killing human rights activists in the group Society for Eradicating Caste. Read this collection of poems and devote yourselves to the abolition of caste, racism, sexism, and related intolerance. We must overcome and see a day where casteism in particular, the world's oldest systemic system of structural hatred and disenfranchisement is driven from the face of the earth. Each and every one of you has the duty regardless of your faith or ethnicity to esteem all people equally, and do all that you can to bring about a better world and society. A world without casteism is an idea whose time is now. Walk in the light of God and be a bearer of light and hope to others. Yours in Solidarity as an American Dalit. Life is the inspiration for Literature. It is unanimously agreed that "literature has the social function of making a bridge between man and society". Literature plays a major role in shaping human personality. It is an indisputable fact that literature mirrors life and every age has its own writers representing the contemporary life. Thus literature helps the readers to understand the society of the day. Poetry is the refined expression of the powerful feelings and philosophical ideas of the poet. The ideas of the poems certainly have a "natural appeal as they emanate from certain basic human situations". A poem in translation seldom receives appreciation but if one can 'see' the efforts of the translator instead of 'looking' for nativity and beauty, one can appreciate translated poems with ease. The poems in this anthology have to be read and understood in their relation to Dalit movements and social exploitation of Dalits. Dalit poets are the voices raised on behalf of the thousands of the exploited Dalits. Dalit poets initially focused on atrocities and social injustice but later they turned their attention to other themes. The origin of Dalit movement in Andhra Pradesh was a historic event. The earlier social movements argued that economic revolution was the basis for all revolutions. Contrary to this, the Andhra Pradesh Dalit movement erupted with the proclamation of self-respect. The cruel, inhuman incidents of Karamchedu and Tsunduru/ Chunduru were the major causes of the birth of the Dalit movement. 17th July 1985 is a black day in the entire Andhra history. It records the cruel slaughter of Dalits (Madigas) with axes and sickles by the landlords (kamma). Several Dalit women were severely beaten up and even raped in broad daylight. This incident instigated many agitations and discussions culminating in the formation of the Dalit Maha Sabha at Vijayawada on 6th October 1985. Here in this meeting, under the leadership of Mr Vyas, the then S.P., the police brutally beat the people gathered at the meeting place. Many of the leaders like Kathi Padma Rao, Salagala Raja Sekhar Babu were arrested. From then onwards the Andhra Pradesh Dalita Mahasabha gained momentum. 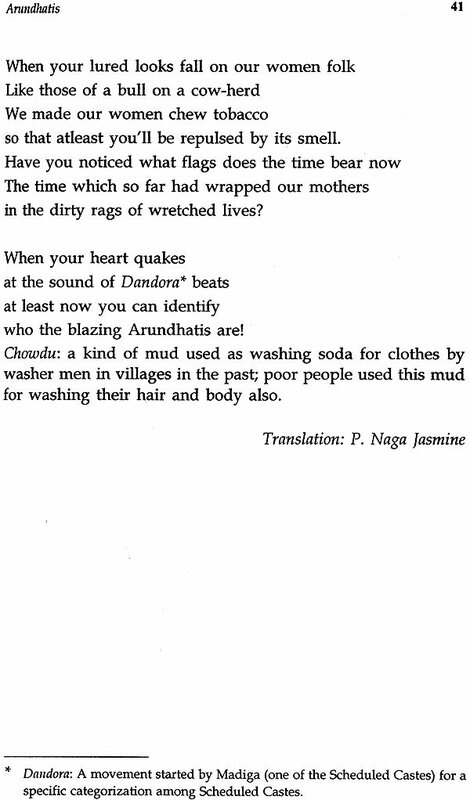 On July 17, 1994, Kathi Padma Rao speaking in the 9th memorial meeting for the death of the Dalits of Karamchedu, said, "As the Naxalbari is for Marxist and Leninist revolutions, the Karamchedu incident is for the Dalit social revolution". The memories of this incident are still fresh and have not faded away. Yet another cruel incident has taken place in Tsunduru/ Chunduru in Guntur district on 6th August 1991. The brutal murders were reported throughout the country by Andhra Pradesh Dalita Maha Sabha. The proud dominant castes of Tsunduru/ Chunduru massacred the Dalits with axes, sickles, swords in broad daylight, chasing them while they ran for their lives. Unlike the Karamchedu victims, the victims of Tsunduru/ Chunduru set a historic demand before the government: that a special court be brought to the doorsteps of the victims for the hearing of the case, and the Government agreed. The Reddys (one of the dominant castes) wanted to suppress and control the Dalits (Malas) of Tsunduru/' Chunduru. The Dalit refusal resulted in the massacre of the Malas. 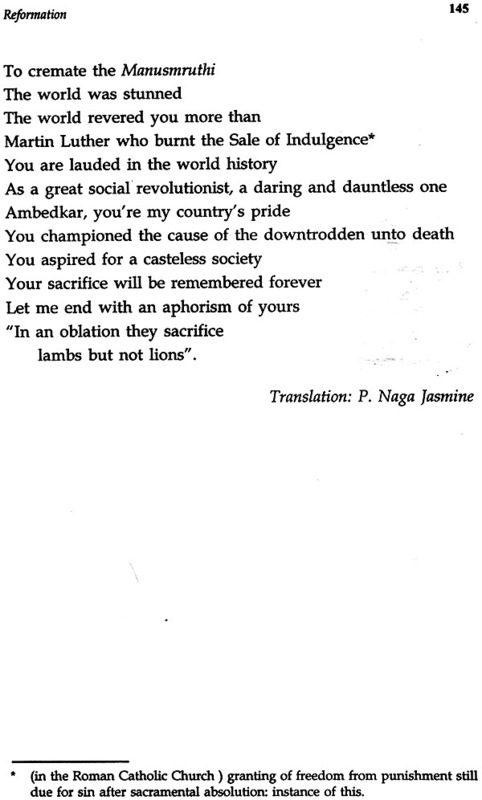 While defining Dalit poetry, Waman Nimbalkar states that, "The Dalit poetry is very loyal to Dalit life. It naturally reflects emphatically the scorching of the Dalit mind because its umbilical cord is linked with Dalit society". 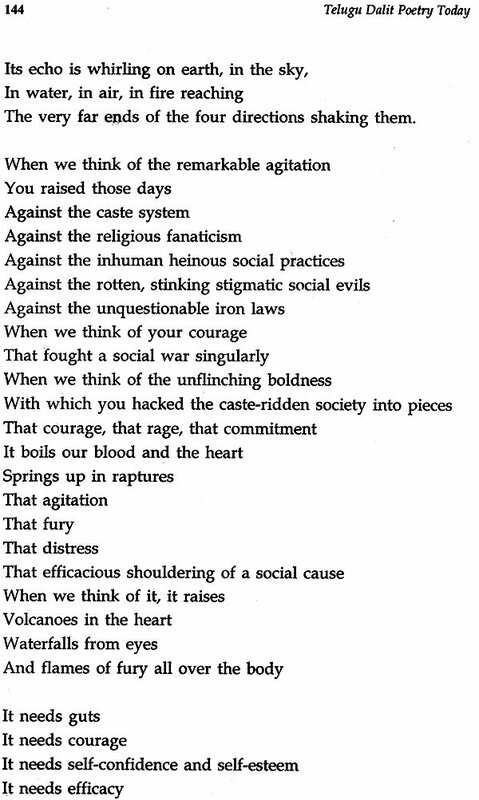 Dalit poets voiced the dumb suffering of thousands of the Dalits for many generations. Telugu poetry took a new turn with the Dalit insurgency in the 1980s. As a result of atrocities on Dalits in Karamchedu, Neerukonda the Telugu Dalit poets became highly alert and declared Ambedkarism their philosophy. Many successful Telugu poets like Sivasagar, Kolakaluri Enoch, Yendluru Sudhakar, Sikhamani, Satish Chandar, Kalekuri Prasad, Challapalli Swaroopa Rani and many others filled their poems with Dalitism. 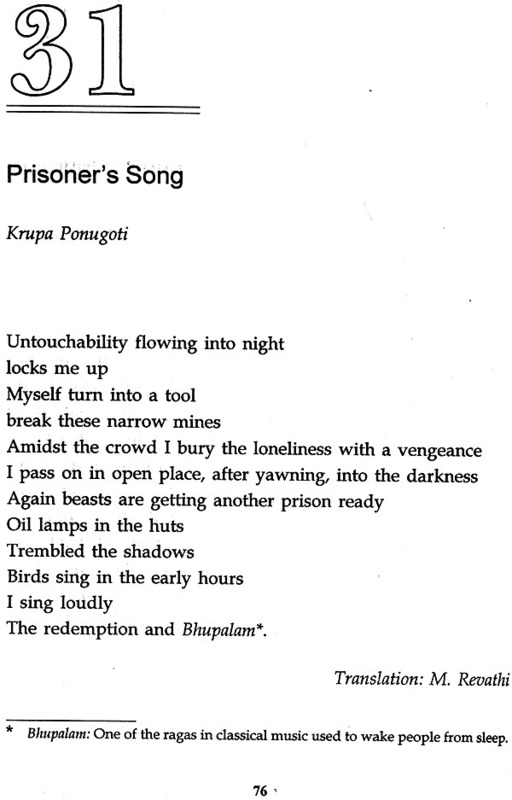 Poetry written after the formation of the Andhra Pradesh Dalit Mahasabha is very radical in treatment when compared with the poetry written during the Independence struggle. The poets showed their anger and protest and challenged the supremacy of the dominant castes. 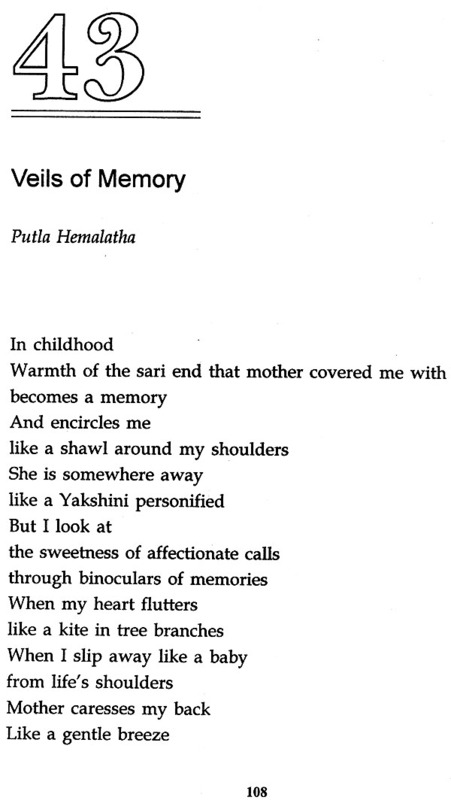 The publication of Chikkanavutunna Pata (Thickening Song) in 1995 created a great tremor in Telugu poetry. This is the first anthology, consisting of the sixty poets works of Se, ST, OBC and minorities for the first time in Telugu literature. Perhaps this anthology marked a thin line of division among the Telugu poets as Dalit and non-Dalit poets. 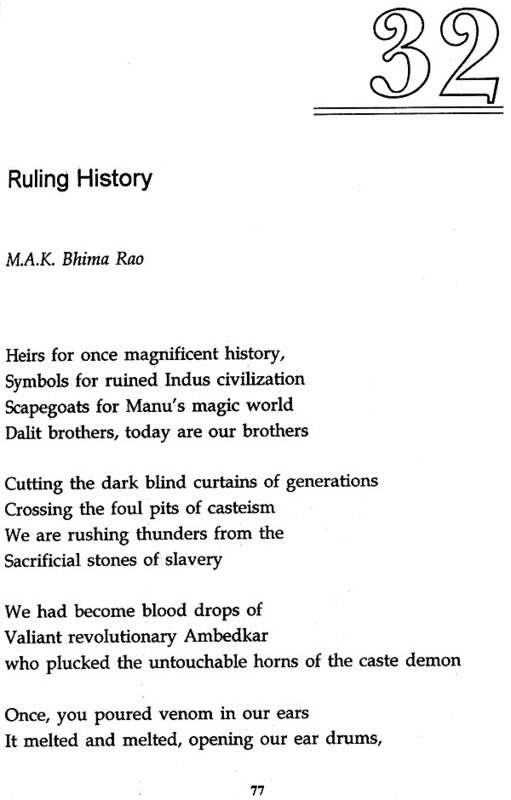 Telugu Dalit poetry criticizes the commitment of Communists towards the practice of caste discrimination. Dalit literature in general and Telugu Dalit literature in particular produced after the 1980s is revolutionary and militant in spirit. Brahminism and its injustice towards Dalits, the protest against the hegemony of dominant castes, anger, self-respect, search for roots, social exploitation are the themes of Dalit literature. Certainly all the writers of this category are much influenced by Ambedkarism. Ambedkar is a well-known leader of the oppressed and the critic to raise his voice against Hindu Dharma Sastras very systematically. In his book, Annihilation of Caste, he aptly said, "the Indian society was formed with an ascending scale of reverence and descending scale of contempt" . It is a well known fact that no menial work is carried out without the help of the so-called lower caste people, yet they are not given the recognition or respect they deserve. Instead they are humiliated and are made to think that such kind of work is their lot, their inheritance and obligation. Dalits, having realized the major role they play in society and the humiliating reward they get in return, now fight for the rights they have been denied for ages. They felt it is high time to assert their rightful place in society. 'This anthology comes before you with select poems that cover a wide area of human suffering in general and social exploitation in particular. Care has been taken to include promising young poets. The initial anthologies of Telugu Dalit poetry included poets of SC, ST, OBC and Minorities. 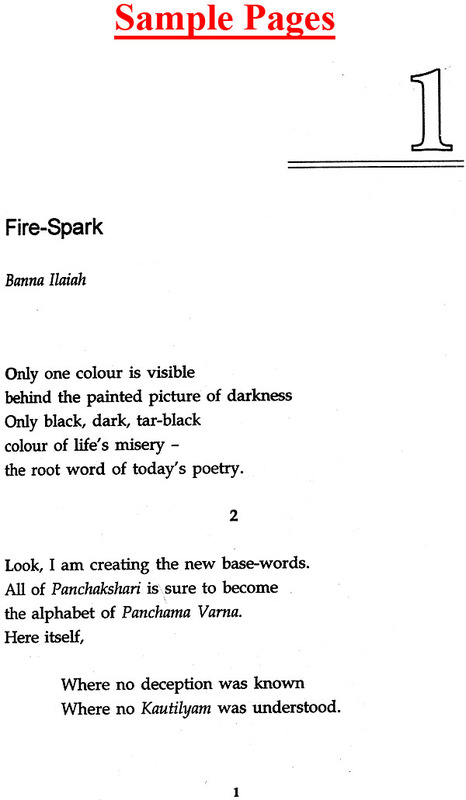 Hence in this collection also, poets like Surya Vamsi and Salandra are included. The poems- are selected to represent various themes such as interrogating history, protest against religious sanction of caste discrimination, social injustice, atrocities on individual Dalits, the suffering of Dalit women, need for self-respect etc. 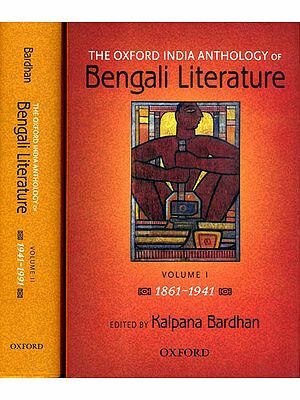 I along with the publishers would like to thank the editors, Indian Literature, Kakatiya Journal of English Studies and all the translators who willingly translated the poems. But for the cooperation and contribution of the translators this anthology could not have seen the light of the day. I immensely thank Dr. W. Randy Short, my fellow sufferer in the society, for writing a meaningful foreword to this work.